How do you change a company? And how do you avoid being overrun by new forces? 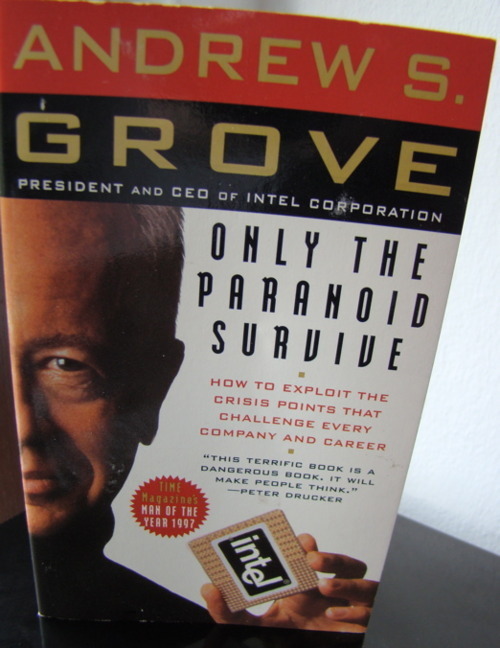 Andrew S. Grove explains how Intel changed from a semiconductor company to a microcomputing company. Strategic inflection point: Grove defines a strategic inflection point as a point or period in which a force (see Porter five forces analysis) gets 10X stronger. For example, in the 80s, the Japanese memory industry grew very fast and got very cheap. This was a gruesome experience for Intel because they were known as the memory company in the USA. Always observe your environment: To avoid being overrun by such changes, you should always observe your environment, i.e. your customers, competition, new technology, your suppliers, etc. Only if you can see emerging 10Xs you can act fast enough. Is it a 10X or isn’t it? There are a lot of changes but which are important? Ask your employees, customers or vendors. Often the CEO is the last one to see a change. If you think that one of these 10X forces isn’t really one, don’t discard it. Observe if it changes and then valuate it again. Change from top and bottom: You can’t force a change from the top, but also can’t form a cooperate strategy from the bottom. It is important that you use both forces to carry out the essential modifications. This is a excellent book on changing a company. Andrew Grove recounts his own experiences and don’t try to please everybody. Half of the managers quit the company because they don’t wanted to change. The other 50% had to reeducate themselves. Changing a company isn’t easy and there will be casualties but it’s better than completely vanishing. Clear recommendation!